Area : 25 sq. km. Languages : Gujarati, Hindi & English. Temperature : Max. 33°C and Min. 23°C in Summer. Max. 28°C and Min. 11°C in Winter. Rainfall : 65 cms to 177 cms. Clothing : Light Tropical in Summer. Light woolen in winter. Best Season : February to June & September to December. Mount Abu is situated at the highest peak of southern tip of the Aravali range at an altitude of 1220 meters, the only hill resort of Rajasthan, amidst the lush forested hills. Mount Abu is more than just a summer retreat. The hill owes its cool climate to its rich flora covering the entire hillside that includes coniferous trees and flowering shrubs. 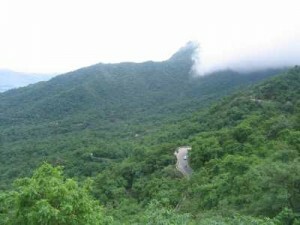 The road leading to Mount Abu is a curved one characterized by arid region dotted huge rocks with high velocity winds. 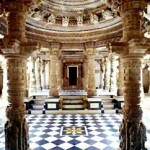 Its stunning array of exquisite Dilwara Jain Temple of 11th – 13th centuries make it a popular pilgrimage centre also. When ascending the mountain, one can hardly fail to be impressed with a grandeur and the scenic beauty, the gigantic blocks of rocks, along the crest of the hill, are especially striking. Air: Nearest Airport is Udaipur (185 km). 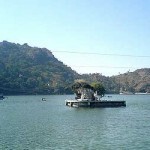 Taxi, buses are available to reach Mount Abu from airport. Rail: Nearest railhead is Abu road (29 km). Good train connections are available from major cities of India. Road: Good network of bus and taxi services are available. Local Transport: Unmetered taxis and jeeps. Dilwara Jain Temple: These beautifully carved temple built between 11th and 13th century AD are sheer elegance in marble, dedicated to the Jain Tirthankaras. Gaumukh Temple: A natural spring flowing through a sculpted cow’s head gives the shrine its name.The famous ‘yagna’ of sage Vashistha was performed here. A beautifully sculpted hill temple of Arbuada, the mighty serpent, stands against the beautiful backdrop. Nearby is the magnificent marble image of Nandi, the celestial bull rescued by Arbuada. Om Shanti Bhawan, also known as the Universal Peace Hall, it is the Brahma Kumari’s world spiritual university. A big hall without pillars cans accommodate upto 3,500 people. Adhar Devi Temple: The beautiful temple is chiselled out of huge rock reached by a flight of 360 stairs.It is a marvellous tourist spot. Sri Raghunathji Temple: Situated near the Nakki Lake is the temple dedicated to Sri Raghunathji with a beautiful image of deity that was placed here in 14th century AD by Sri Ramanand, the famous Hindu preacher. Nakki Lake: The only artificial lake in India, which is 1200 mts above sea level, believed to be scooped out by the god’s with their nails or ‘Nakh’. Museum and Art Gallery: Located at Raj Bhawan, it has a collection of archaeological excavations dating back to 8th-12th century AD. 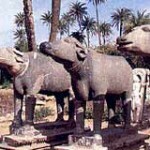 It is also has Jain bronze caevings, brassworks etc. for viewing. Sunset Point: Spectacular sight of the setting sun when the hills are covered in the golden glow can be viewed from here. Gardens and parks: Beautifully laid parks and gardens are interspersed throughout the hilly paradise. Ashoke Vatika, Gandhi Park, Municipal Park, Shaitan Singh Park and terrace garden are some of the noteworthy gardens. Honeymoon point: Also known as Anadra Point, the enchanting view of the verdent valley and the plains is breathtaking during the dusk hours. Trevor’s Tank: Trevor’s Tank is lies 5 km from city centre and named after the British engineer who constructed it, Trevor’s tank is a delight for birdwatchers with densely wooded hills that are a haven to pigeons, peacocks and partridges. Achalgarh: Achalgarh is situated 8 km from city centre, an impressive fort with some beautiful Jain temples enclosed within. Among the noteworthy temples are Achaleswar Mahadev Temple dates back to 1412 A.D. and Kantinath Jain temple dates back to 1513 A.D. The latter has a gold plated image. Mandakini Kund and a sculpture of Parmar Dharavarsh are situated close to the Achaleswar Mahadev Temple. The fort was built in the 14th century A.D. by Rana Kumbha and is approachable by a motorable road. 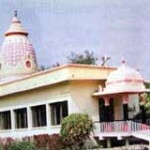 Guru Shikhar: Guru Shikhar is located 15 km from city centre. It is the highest peak on the mount (1772 meters). 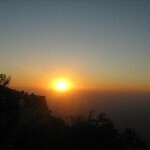 It offers a bird’s eye view of the sylvan surroundings of Mt Abu. 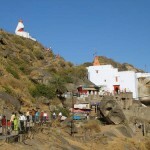 There is a small Shaivite shrine and temple of Dattatreya standing on the shikhar are worth a visit. 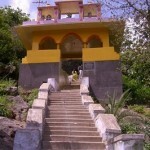 Sirohi: Sirohi is a district, situated 63 km from Mount Abu. It is surrounded in the north-east by Pali, on the east by Udaipur on the south by Banaskantha (In Gujarat), and on the west and north-west by Jalore. It is popularly believed that Sirohi has derived its name from the “Siranwa” hill, on the western slope of which it stands. Sirohi also means “swords” and it has led some people to believe that this states of brave Deora Chauhans received its present name due to the widespread fame of its swords. This entry was posted in Mount Abu, Rajasthan and tagged about mount abu, Achalgarh, Adhar Devi Temple, Dilwara Jain Temples, Gaumukh Temple, Guru Shikhar, Honeymoon point, mount abu attractions, mount abu hill station, mount abu images, mount abu maps, mount abu pictures, mount abu places to visit, mount abu temple, mount abu tour, mount abu tours, mount abu travel, Museum and Art Gallery, Nakki Lake, Sirohi, Sri Raghunathji Temple, Sunset Point, Trevor’s Tank, weather mount abu. Bookmark the permalink.